If the time has come for you to install a new floor in your home or business it is highly recommended that you choose polished concrete. In the past concrete floors were cold and uninviting but today they can be polished and stained with beautiful designs. These floors are an excellent way to brighten up any room that they are installed in and they come with several good benefits. The first is that they are very long lasting. Concrete has been used for construction for centuries because it is one of the hardiest building materials. By installing this kind of flooring you are guaranteed that you will not need a new floor for a long time. You can have your new polished concrete floor in any color and design that you want. In fact, you don’t even need to have the same designs and colors in all rooms – you can have different designs and colors to match the themes of different rooms. In other words polished concrete gives you the opportunity to customize your floors to whatever designs you may desire. The other benefit of concrete polishing is that it is easy to clean. All you need to do whenever your floor gets dirty is wipe it down with some and a little detergent – it doesn’t require special treatment such as polishing, which you have to do often with wooden floors. Polished concrete is also a great way to get rid of dust and other contaminants in your home. There will no longer be the need for carpets and rugs to make your floor look attractive – the designs on the floor are enough by themselves. Anyone with allergies in the home will benefit greatly from having a concrete floor installed. In a nutshell, polished concrete is a great choice for a new floor, be it in your home or in your business. Seamless Epoxy Floors: Why Do They Come Preferred? When you are choosing a new floor for your home one kind that you will come across is seamless epoxy floors. To understand what they are let us first look at what epoxy is. It is a kind of resin that you get when you mix epoxy resin and polyamide. It forms a thick kind of coating that makes excellent floors. Seamless means that there are no seams in the floor it is one continuous sheet. This kind of flooring doesnt have spaces in between tiles which makes it a lot easier to keep clean there is no grout where bacteria, mold and spores can hide. Seamless epoxy can be installed in just about any room in your home. Since they come in many colors and designs you can get them to work for just about all kinds of dcor. You will have installed floors in your home that will last many years in fact, epoxy floors are some of the longest lasting in the market. They are also easy to clean and maintain all you need is a wet mop passed over them and they get clean. In fact, they maintain a waxy look despite the fact that you never need to wax them once. One question that is often asked when it comes to seamless floors is whether urethane flooring is the same. The answer is that these are two completely different materials but both are poured onto concrete floors to protect them and make them look more attractive. That said, epoxy tends to last longer and you get many more style and design options. By installing seamless epoxy floors you will not only be making your home unique and attractive, you will also save yourself money because you are installing hardy, durable floors that will not need to be replaced for a long time. You have decided that it is high time you renewed the flooring in the garage on your property but are wondering what you should replace it with – with so many floor coatings in the market how do you know which one you should choose? You definitely want something that is hardy and attractive which is why you should be considering epoxy garage floors. Epoxy is a type of resin which when mixed in equal part with polyamine makes a kind of flooring that is hard to beat. •;; ;The first is that when it comes to durability these floors are hard to beat. Unlike a coat of paint which dries once it is applied to the floor epoxy cures onto the floor and forms a thick coating which is very durable. •;; ;If your garage floor is made of concrete over time it will start to crack and chip. You can stop this wear and tear from happening by installing an epoxy garage floor. Not only will it protect the areas of the floor that aren’t damaged already, it will get into any chips and cracks that have already formed and seal them so that there is no further damage. •;; ;You may have noticed that your garage is getting dustier and dustier as the years go by. This is because the concrete is wearing and tearing – it sends dust onto all the surfaces in the garage all the time. You can stop this from happening by installing an epoxy floor. •;; ;Epoxy floors come in a wide range of colors and finishes. You can use it to brighten up your garage and even convert it into an office. •;; ;Epoxy flooring is easy to install – you can get it done yourself in a couple of hours if you are a handy person. Installing epoxy garage floors is one of the best things that you can do for your garage. When choosing a new floor it is important to take all factors into account. The first thing that you should take into account is durability flooring is expensive and you dont want to pay for it every few years. In addition to that the floor that you install should allow any room to be used for many purposes especially in a commercial or institutional setting. One floor that meets these requirements is a seamless epoxy floor. Epoxy resin is a tough material that is used in floors to make them look better and last longer. A seamless floor means that there are no joints in the floor s you would get with tiling and other kinds of flooring everything is poured on in one smooth layer. The first and most important advantage of seamless epoxy floors is that they are easy to clean. When a floor has seams it is harder to keep clean because dirt and other debris get caught in them. If you want to get the floor completely clean you have to get into the seams one at a time and remove the debris. This takes a long time and is not practical on a day to day basis. A seamless floor is great because all you need is to pass a mop over it there is no debris caught anywhere. Another advantage of seamless epoxy floors is that they are environmentally friendly you get the same kind of finish as you would if you were to wax your floors but without affecting the environment. Epoxy floors are also great because they are non-slip in a hospital or a school or even an office this is a huge benefit. Epoxy floors, seamless or not, are some of the longest lasting in the world. You can be sure that by installing seamless epoxy floors you will be saving yourself money in the future. If you are reading this it is quite likely that you are in the market for a new garage floor and are wondering which floor coating would be best. With so many options in the market it can be quite hard to come to a decision. The good news is that epoxy garage floors are some of the best that you can ever find. Many garage owners choose them because they come with several advantages. The first is that these floor coatings are long lasting. Once you install one you can expect it to last for years before you need to replace it. They are resistant to common floor damage such as scratches, cracks and more. The other reason why so many people choose to install this garage floor coating is the fact that it comes in a wide variety of colors – you can customize your garage to look like anything that you want. You will also find it in different finishes, which adds to how many different things you can do with it. Epoxy garage floors are also easy to clean. Most garage floors end up being messy because of oil spills and grease stains but if this happens to an epoxy garage floor you don’t have to worry. You can clean it with hot water and strong scrubbing will not affect its surface. In fact, it is for this very reason that so many restaurant owners go with epoxy floors – they are easy to clean. If you want to make your epoxy garage floor safe you can add anti-slip additives. These are clear in color and will not affect the way your garage floor looks – the anti-clip granules are locked in there and look more or less like sandpaper. As you can see, there is no reason why you should be looking for any other floors when epoxy garage floors come with so many advantages. There are many kinds of floor coatings in the market today and as someone who is refurbishing their home you may be wondering which one is best to go with. One of the most highly recommended is seamless epoxy floors. To understand why, let us talk about what epoxy floor coatings are and then what it means for them to be seamless. An epoxy floor coating is a tough, durable coating that is applied on the floor in two layers. It comes in all kinds of colors and you can mix it with other ingredients so as to add texture to your floors. When we talk about seamless flooring we are talking about flooring that doesnt require grouting it is applied on the floor in two continuous layers that have no breaks in them. These kinds of floors come with several advantages. First, there is no grout maintenance as you may well know grout needs to be cleaned and replaced every so often. The other advantage is that if there are contaminants in the home the floor will not be affected much since there is no way for the contaminants to get in. The last advantage of having seamless flooring is that you have a whole host of designs to choose from your home will definitely look different because not many homes have this kind of flooring. You can play with all sorts of styles to suit your dcor. How about urethane flooring, you may be wondering? This is another kind of flooring that is becoming more and more popular but not for use in homes. Mostly, it is used in environments where there are a lot of stains and where temperatures can get very high. It is a great kind of flooring just like epoxy but it has one major disadvantage it doesnt bond very well to concrete which is why it isnt used much in homes. Why are Epoxy Garage Floor Coatings Better than Paint? If you are reading this post, it is quite likely that it is time to refurbish your garage and you are wondering what kind of flooring it should have. Many homeowners choose to paint their garage floors because it seems like the easy way out. Although it may be a simple painting procedure, it may not necessarily be the best choice. Epoxy floor coatings offer better features that you simply don’t get with a bucket of paint. Most importantly, epoxies provide additional durability for garage floors. The last thing you want to do is have to repaint your garage floor every few years. Epoxy offers a tough floor coating that won’t chip or crack when tools or bicycles fall and hit the floor. Epoxy coatings hold up to tough conditions found in a garage environment. Another benefit: beauty. Garage floors tend to be on the dull side as far as appearance goes. 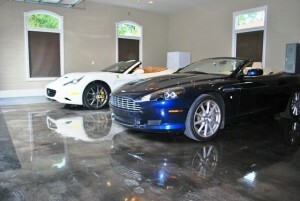 One way to liven things up is to choose epoxy garage floor coatings. They come in many different colors and finishes, which means that you can choose whatever you feel will best brighten things up in your garage. Different tints, shades and dyes available today provide you a whole palette of colors to select from, and add to that smooth or texture, and your options are countless. If you are looking to reduce your carbon footprint, epoxy garage floors provide an eco-friendly means to sustainable living. Many paints are not so environmentally-conscious so using specialty epoxies provides a means to improve your garage and stay friendly to the environment at the same time. Application is also easy and quick. The flooring dries rather fast because typically only 2 layers are needed, which means the turnaround time for a new garage floor is pretty quick! Call us today for a free estimate on resin epoxy flooring for your garage: (401) 297-3257.